U.S. based mega-yacht builder Christensen is known for delivering high quality super-yachts with excellent fit and finish. In recent years the company has undergone a change in leadership and just delivered two new 50m (164′) builds earlier this summer, the first deliveries since the company’s sale to co-owner Henry Luken in July 2015. Built for a repeat customer the 50m M/Y Silver Lining was the first to launch followed by M/Y Chasseur. Silver Lining is a displacement yacht built entirely out of GRP and features a six cabin layout with comfortable accommodations for 12 guests and up to nine crew members. Powered by twin MTU engines she has a range exceeding 4,000 nautical miles and cruises at 14 knots with a top speed in excess of 16 knots. With a beam of nearly 30′ Silver Lining includes features such as a Jacuzzi and helicopter landing pad. Launched shortly after Silver Lining, the 50m M/Y Chasseur also features an entirely GRP displacement hull and superstructure. When it comes to general specifications the two mega yachts have much in common including their dimensions and cruising speeds. As a result Chasseur boasts a comfortable six cabin layout with accommodations for 12 guests and up to 10 crew. The nearly 30′ beam allows for many of the same features found on Silver Lining including a jacuzzi, helicopter landing pad, office, zero speed stabilizers and more. Despite the dimensional and layout similarities the two yachts differ in their interior design with Silver Lining boasting a dark, black walnut wood interior and Chasseur demonstrating a lighter more modern design. Under its new leadership Christensen has two more 50m yachts under construction with estimated delivery dates in 2018. Christensen is worth keeping an eye on as they continue to deliver high quality super-yachts in the coming years under new leadership. 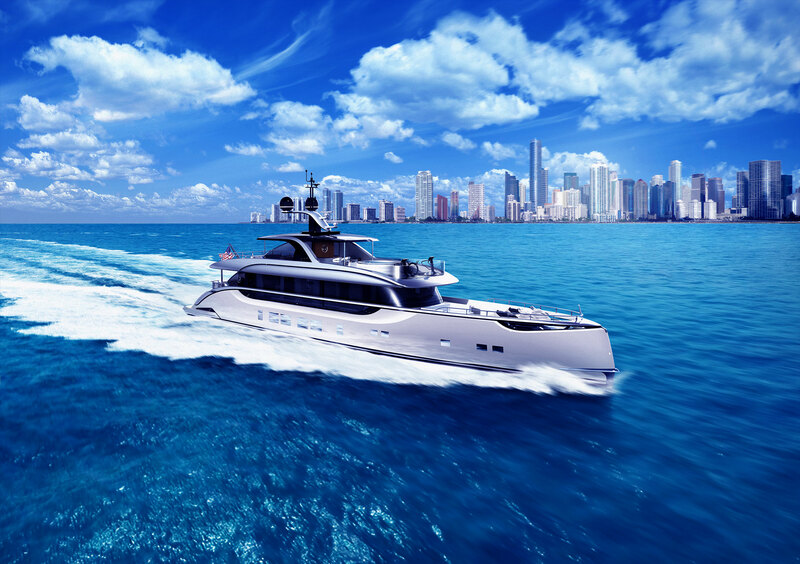 Silver Lining and Chasseur will both be on display at the Fort Lauderdale International Boat Show from November 3-7th.